I think all moms would agree with this one. Snuggle lots and lots. 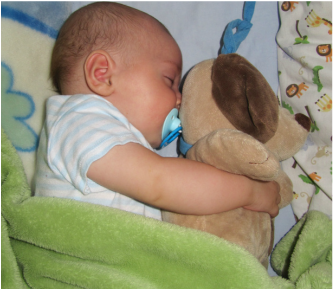 Babies love to be snuggled - feeling warm and secure, and hearing your heartbeat (which they've been listening to for the last nine months). Plus it encourages bonding between you and your baby. Be sure to get Daddy in on the snuggling too! They grow so fast so enjoy this time as much as you can! Giving baby a bath isn't really necessary in the first few weeks and can be scary for them. They are so use to be in a tight space that being undressed and not held close, can be traumatic. A wet warm cloth can be used to wash them down an area at a time without completely uncovering them. My babies would even sometimes sleep through it. Gently washing their eyes (inner corner to outer corner to avoid infection), face, ears, head, neck, and then washing their bottom, being careful to clean out all the little crevices. Follow that with cord care (gently cleaning the cord area with a Q-tip moistened with alcohol), and that's it! Frozen meals, fast or easy meals (lots of cereal, pasta, etc. ), and snacks are so nice to have around when you're either too tired to cook, or baby is crying, or you need to get off your feet because you're supposed to be recovering. Even if you know you'll have family or friends helping you out with meals, it's still nice to have some backups, and food for breakfast, lunch, and snacks. Your baby's main mode of communication is crying.So don't panic when they cry. If you can stay calm and check all the things to find what your baby needs it will help your baby to calm down also. Check the obvious things such as.....diaper or if its time for baby to eat. If it isn't any of those then your baby may just want to be cuddled a bit. Some babies struggle with colic (gas) at an early age. One sign is if they are pulling their knees to their chest when they cry. If the pattern continues your baby may have colic. 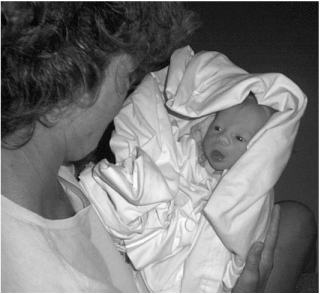 Keeping the baby bundled and warm can help. There are many gas remedies you can buy for babies that can be helpful also. It feels great to get to sit around in your sweats all the time. But only for so long before you'll probably start to go a little crazy. After a week of basically just sitting around all day (you'll be doing lots of sitting with as often as newborns eat!) You may want to get out of the house. Obviously, you still need to be taking it easy - you just had a baby! - but maybe take baby for his first walk around the neighborhood. Or maybe just go for a drive. Or leave baby home with Daddy and go to the grocery store, or spoil yourself with a pedicure. Just something so that you have to shower, and get dressed, and feel slightly more human again, and get a little change of scene. For me it helped me deal with the new mommy blues! Whether you've had a c-section or a vaginal birth, your body has been through a rough time; your hormones are all over the place; and your lack of sleep is not helping matters! Keep a few things handy like water bottles, granola bars, minty gum, hand sanitizer, diapers, baby wipes, burp rags, and, most importantly, chocolate! Maybe keep these things in a basket in range of your nursing area. Take showers when you can. Accept casseroles and other offerings of meals from friends. If you don’t have help for the housework, just do the bare minimum so you can rest and recover and focus on getting to know your sweet new baby! This will be a life saver for you in these early months.Even if you only sleep a half hour, it can help you cope with everything. Also give your baby a 3 hour nap limit. Don't let baby sleep longer than three hour stretches during the day. Babies are almost always more nocturnal when they're born, and this will usually help sort that out, and encourage their longer stretches of sleep to be at night. You don't want to have to go hunting for them in the middle of the night, or when you're covered in spit up, or when you're just feeling too tired to get up and find one. I keep a pacifier in the crib, the bouncer and the diaper bag. Keep a burp rag on hand anywhere you feed the baby -the rocking chair, on the couch, and in the diaper bag for when you go out, etc. Babies are used to being all warm and snug in the womb. They'll sleep much better all swaddled tight. Birth is a huge transition for a baby! From a warm, dark, weightless environment where all their needs are met, sounds are muffled, and mama’s heartbeat lulls them to sleep, they are abruptly ejected into a cold, loud, bright world where they experience hunger and discomfort and loneliness and fear for the first time. You can help your little one cope by easing the transition for him/her. There are lots of different types of swaddle blankets that you can buy at baby stores, but I feel like they're usually overpriced, especially when a regular receiving blanket will do the trick. ﻿﻿My babies have loved their bouncer seat﻿﻿s. The slings are a great way to keep them feeling snuggled, and keep them close, but still have your hands free for a little while. Even as tiny as they are, your arms do start to get tired after holding them for hours. The bouncer is great for when you just need a little break, or need to take care of an older child, or cook at the stove, etc.. Here are a few sling and bouncer options, if you are looking. It's hard, especially if this is your first baby, or this baby just doesn't seem to be figuring it out. But it can take a little time, so don't give up too quickly. Give it at least a few weeks, and talk to your doctor or a lactation consultant if you have serious concerns that your baby's not getting enough milk, or if there seem to be other problems. Expect your little one to eat erratically right at first.Their tummies are only about the size of a walnut in the first days, so they can’t eat enough at a feeding to last them more than two or three hours at most, and often far less! But the benefits of breastfeeding, both physically and emotionally for both you and baby, are so worth it if you're able to do it! Have your mom or sister or a friend to talk to for support. It really helps to have someone to give advice or just to listen.Make sure and follow your own instincts about what is right for your baby though. Just because someone gives advice doesn't mean that you have to take it. It is a learning time for you and you will know what is right for you and your baby. This is a huge, huge, huge change for you and your husband, so be patient with each other! You are going from ‘the two of us’ to ‘we three’ and, just as with anything else, change isn't easy. You are having to deal with becoming a mommy, and your body has been through an incredible transition during the previous nine months followed by the trauma of labor and delivery followed by crashing hormones. The trials of learning to breastfeed (or deal with engorgement issues if choosing to bottle feed), and the exhaustion of dealing with a newborn’s erratic sleep patterns. If you had a c-section, you can add major abdominal surgery to that list! So, husbands, put your own issues aside and baby your wife and baby for the time being! Wives, a little verbal acknowledgement goes a long way with husbands, so try to muster up enough energy to tell your husband that you appreciate him and understand that he is trying to figure out this new life just like you are, and assure him that eventually you will be you again!